How to draw body step by step. Drawing and painting lesson instruction with images. Character concept design Sinbad the Sailor. Here is a post of how I re-imagine one of my most favorite and memorable character, Sinbad the Sailor. I got exposed to the magical world of Sinbad early on watching the film conceptualized and animated by Ray Harryhausen(it was old, and the re-run usually comes on TV when I was a little kid). The very first one I saw is Sinbad and the Eye of the Tiger, then The Golden Voyage of Sinbad, and The 7th Voyage of Sinbad. I pretty much saw almost every single movie that Ray Harryhausen involves in. Also "Clash of the Titans", but it already been just remade. I was thinking about re-conceptualize it, but maybe later. I believe it was before I can read or draw. Before I get to read any Manga, Comics or watch any anime, well with the exception of the old "Karmen Raider" re-run. I could say it was my really early influence for having interested in art, concept and animation. What was on my mind at the time was probably, how the hell did they do that...how did those monsters, creatures come to live! So here is my attempt to conceptualize and sketch my own Sinbad. In this post I first start just sketching the body or figure itself, not even attempting to put him on the scene or having any composition in mind. But then I cannot help but try to put him in the jungle and add some different lighting that might help bring the illustration to life. It doesn't turn out bad at all, but I wouldn't really recommend you do that. Planing is always the best way to produce your cinematic or environment conceptual work for sure. It's almost finish, all I have to do is add a few bad fellas in the black clothes with weapon hiding around the environment. Here is a bit about Sinbad, I'm sure you've heard of him in some form of media. 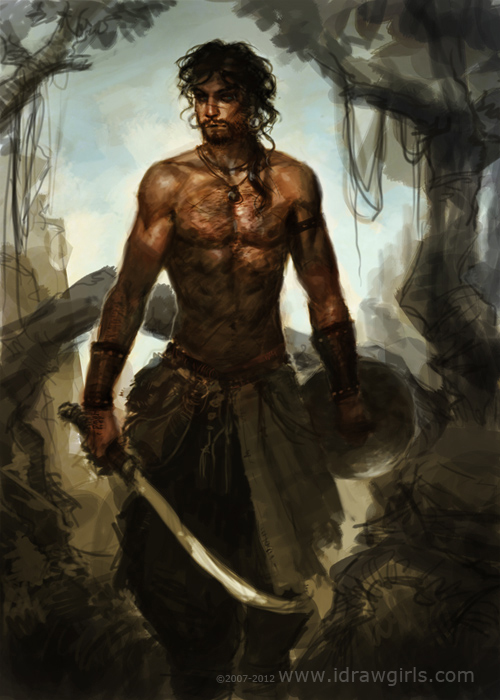 Sinbad the Sailor is a fictional sailor from Basrah, living during the Abbasid Caliphate - the hero of a story-cycle of Middle Eastern origin. During his voyages throughout the seas east of Africa and south of Asia, he has fantastic adventures going to magical places, meeting monsters, and encountering supernatural phenomena. Sinbad is a Persian word hinting at a Persian origin. In fact some scholars believe that it is originally a Persian work, perhaps based on an Indian prototype. The oldest texts of the cycle are however in Arabic, and no ancient or medieval Persian version has survived. A variation of the name, Smbat, can also be found in Armenia, as well as the version Lempad of his father's name Lambad. The Sindhi Sailors, who became famous due to their skills in: navigation, geography and languages may very well have inspired some of the stories of Sindbad ("And thence we fared on to the land of Sind, where also we bought and sold"). Incidents in some stories are also clearly influenced by ancient literary sources (including Homer's Odyssey and Vishnu Sarma's Panchatantra), and Arab, Indian and Persian folklore and literature. More Video tutorialsAlso basic to intermediate anatomy drawing instruction video, they are short but get right to the point and will be useful for studying muscles and human anatomy for artist go watch Drawing body muscle torso anatomy video & step by step and Drawing arm muscles bicep tricep video. Here are for faces and heads, this one is a basic drawing of a man's head, possibly warrior brutal type, how to draw man's head basic. If you are looking for more rendering facial tutorial go to Character Design Face Male Merchant Character, or Drawing Male Face Swordman and Learn how to draw and paint face. They might suit your need more. 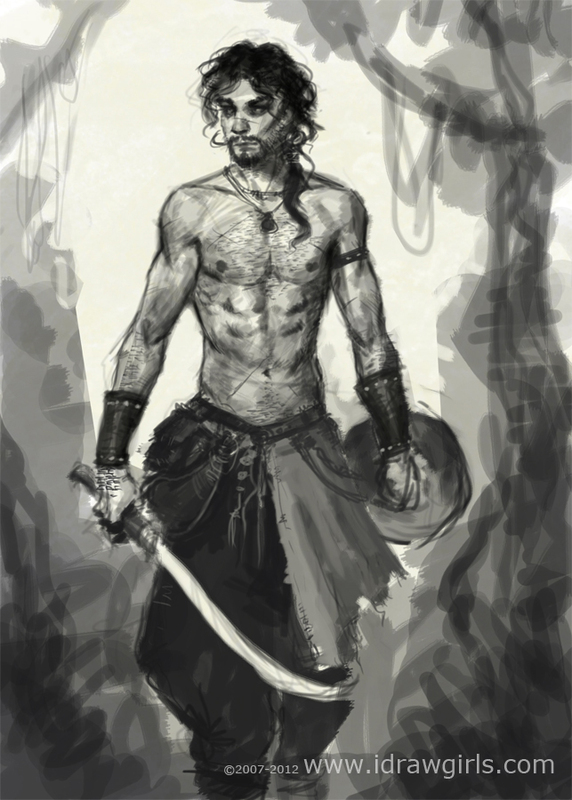 Here is an almost final version of Character concept Sinbad the Sailer. Here are step by step from rough black and white sketches. Painting process, assign color scheme. Then here is the final sketch, a little bit more painting here and there then I would be done. Very cool concept :) I like the colors you used! Keep going! This one's really cool my friend...I really like how you managed to control the values on the abs area. Mostly I really like the shadow casted from the trees on his right biceps and the highlight on his chest. Keep rocking dude, love the loosness on the brushwork. really love your artwork. I've been following them for quite some time now. As you've inspired me in lots of ways encouraging even those who don't know how to hold a pencil. I was wondering if you have any recommendations other than the links you've posted on your page? Somewhat similar style to your artwork..
Luca> Thanks brother, that's cool the old one also shot in Malta. I have no idea they are remaking it as a series. Nice!